Galangal is a member of the ginger family, but it has a distinctly different flavour to ginger. 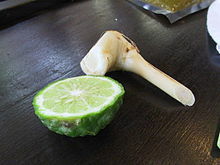 Other names include galanga, galangale, laos, and blue ginger. Galangal is widely used in the cuisine of South-East Asia, and can be bought as fresh whole root, sliced, or as a dried powder. In Galanga, there are two different varieties which one is known as the “Lesser Galanga” and other called to be the “Greater Galanga” which is very light in color and subtler in whiff you can easily find in most Thai cooking. This page was last edited on 15 October 2015, at 10:49.